"When you make things personal, it makes people want to continue the journey alongside you. It gives them a perspective different from their own, and real social change cannot happen unless we are listening to people other than ourselves." 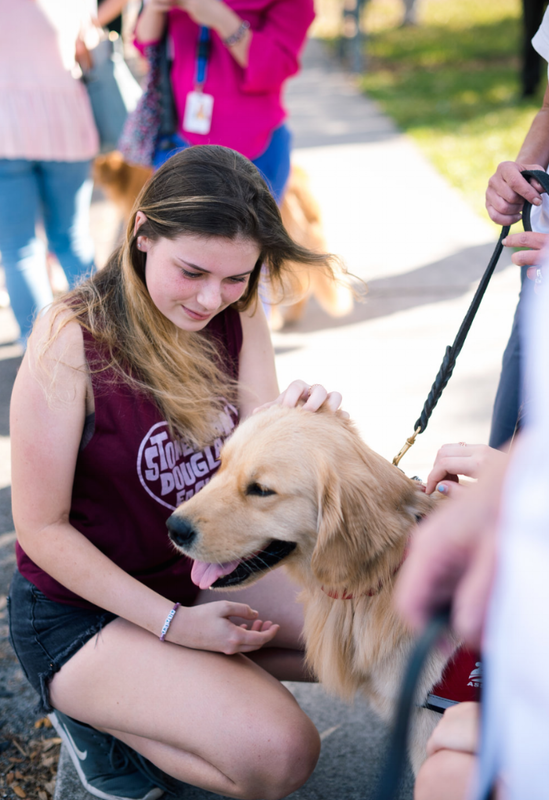 There are few young voices in the media these days that are speaking louder than the survivors of the mass shooting at Stoneman Douglas High School earlier this year. Rallying in front of millions of people, standing up for themselves, their generation, and generations to come against gun violence and the epidemic of mass shootings in schools, students like Emma Gonzalez and David Hogg have more of a voice than ever before, and aren't afraid to use it. 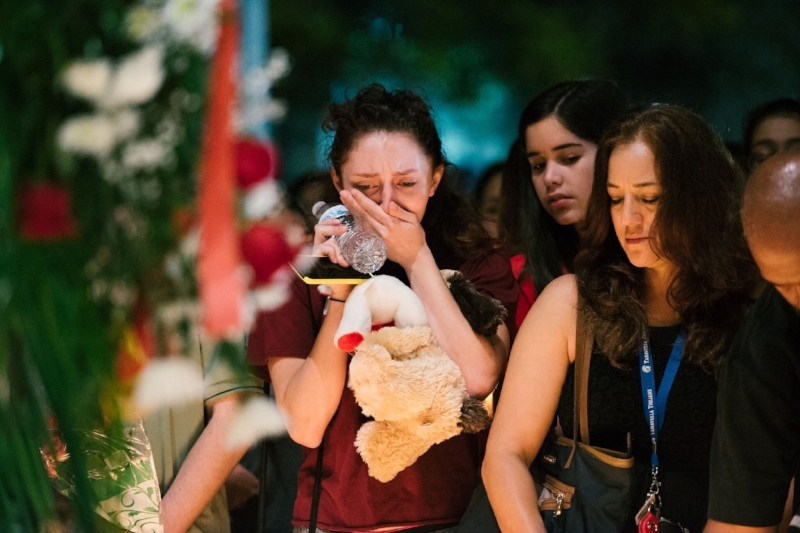 Now enter photojournalist Emilee McGovern—whose images of Gonzalez, Hogg, and grieving survivors have become synonymous with the movement itself—and there's a whole new component to the media's influence: the power of raw emotion through still photographs. 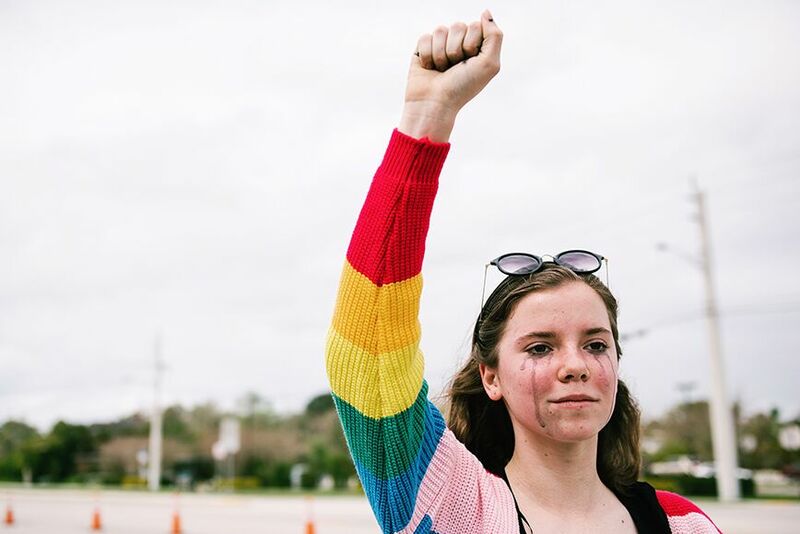 I spoke with Emilee by email about her impact as a photographer on social change, approaching subjects who are in emotional pain, and how her subjects have affected her. Emma Gonzalez by Emilee McGovern. 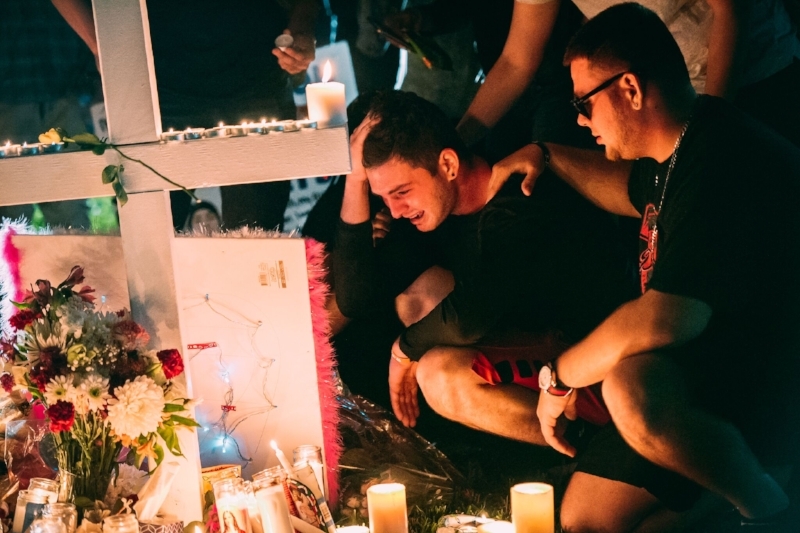 Cailin Loesch: Even after seeing the photo you took of Emma Gonzalez dozens of times in the media, I didn’t find you as a photographer until I read the profile that Miami New Times did on you. As a photographer, what brought you out to the rally that day? What were you looking to capture of the Parkland students that hadn’t already been seen? Emilee McGovern: Well, for me, I was so immersed in this story from day one, that I had no idea what had or hadn't been seen yet. I had no time to watch any news coverage; I was my own coverage. So I wasn't even fully aware that there was this powerhouse of student activists beginning to emerge. I was just trying to cover all aspects of the aftermath within my community: Who was there, why were they there, and what was their story? My plan was to spend most of my time capturing crowd reactions, but once Emma Gonzalez and David Hogg took to the stage, everything changed. I literally felt everything shift. After spending multiple years covering gun violence issues, I knew we had just crossed over into something very different. Because of this, I knew I wanted more than just images of them from behind a podium. I wanted something even more raw, something that would truly stick and impact others. You can watch the video of their speeches 100 times, but there is something about those portraits that brings it home for a lot of people. This is why I’m obsessed with the still image. It has such lasting effects. It’s important to also know that neither of them were prompted by me on how to pose, or not to smile. I told them I simply wanted to capture them genuinely, in this moment, and that is what they shared with me. CL: You have covered many major rallies and protests and similar events over the years, from Parkland aftermath events, to rallies following the shooting of Trayvon Martin, to protestors at Donald Trump’s inauguration. 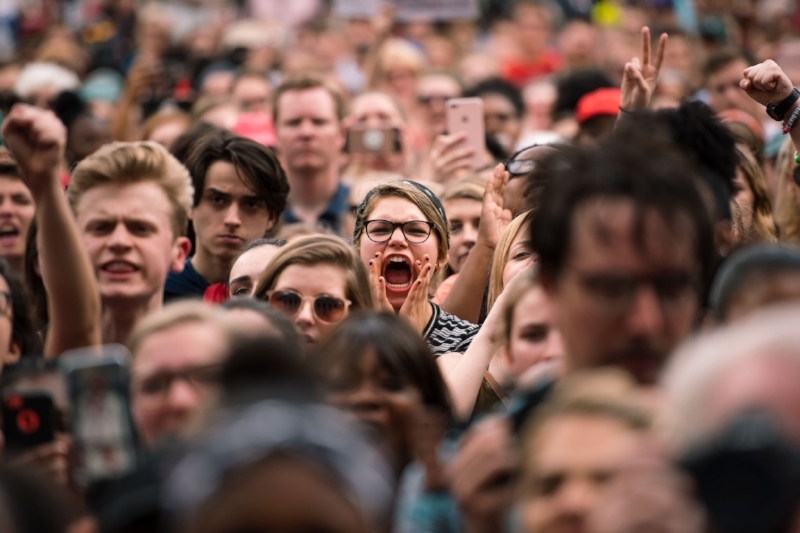 Just in the last couple of years, rallies and protests are more common than ever before, and they are more highly publicized than ever. Do you think that a new name will be given to this kind of photojournalism...rally photography? EM: It would actually be very interesting to see if that will be the case. I definitely think it is in it’s own class of photography and journalism. I think it requires a very different skill set from other photography specialties, many that have very little to do with anything photography related. For me personally, it is something I’ve always known I was meant to be capturing. Even when it wasn't necessarily going on in this country. It’s like I was being prepared for it. This is why I believe this type of work is more of a calling and less of a choice. Trayvon Martin was such a pivotal point in my life. I regularly share that he is exactly what changed mine. I originally started documenting protests, as my own personal way of stepping up and advocating, while seeking understanding. I had many critics along the way, people who disagree completely with the act of protesting. So it wasn't an easy thing to pursue. Support was hard to come by. But I never doubted that I was doing the right thing. There was a reason I was given the ability to empathize with those fighting in this way, because I needed to show their truth. CL: Since social media has made it easier for everyone from hired photographers and freelance photographers to citizen journalists to share photos that they take at large-scale events, there is more out there than any of us can keep track of. What do you think a photographer needs to do to make their photos stand out? EM: I can’t say that I myself have even figured that out yet. I’d like to believe it has to do with creating content that is genuine. Doing everything in your power to make people feel like they are a part of something, like they are there, even just from behind their computers and cellphones. Making them feel so much, that they are completely compelled to share it. To them, sharing puts them in this. They are such an important aspect to the telling of a story, they will be the reason that story lives on. You need to have their trust, and respect. Make sure when you are photographing, that you are completely in every moment, don’t plan out shots, just wait for them. Patience is key. Observe, let your subjects guide you. Let them move you. Take every photo from a personal place. If you feel it, than that is exactly what will translate. CL: Along with the images you share on your social media, you often write captions that describe the way the people you meet through your work affect you on a deeply personal level, which I find very moving. How would you describe the role you hope your photos—and photography in general—have in social change? EM: I know some might take issue with me placing any of my own emotions into a story, but this is why building trust with your audience is important. My own feelings are what leads me to someone, what leads me to every single image I’ve ever taken, so leaving that out of the story, I feel would be a disservice. It wouldn't be the whole truth. It’s like when I like a song, and I wonder what made the artist write it; what were they dealing with at the time. Their view doesn't change the song for me, it just brings it to a whole new level. It fills in this big missing part, and when you make things personal, it makes people want to continue the journey alongside you. It gives them a perspective different from their own, and real social change cannot happen unless we are listening to people other than ourselves. 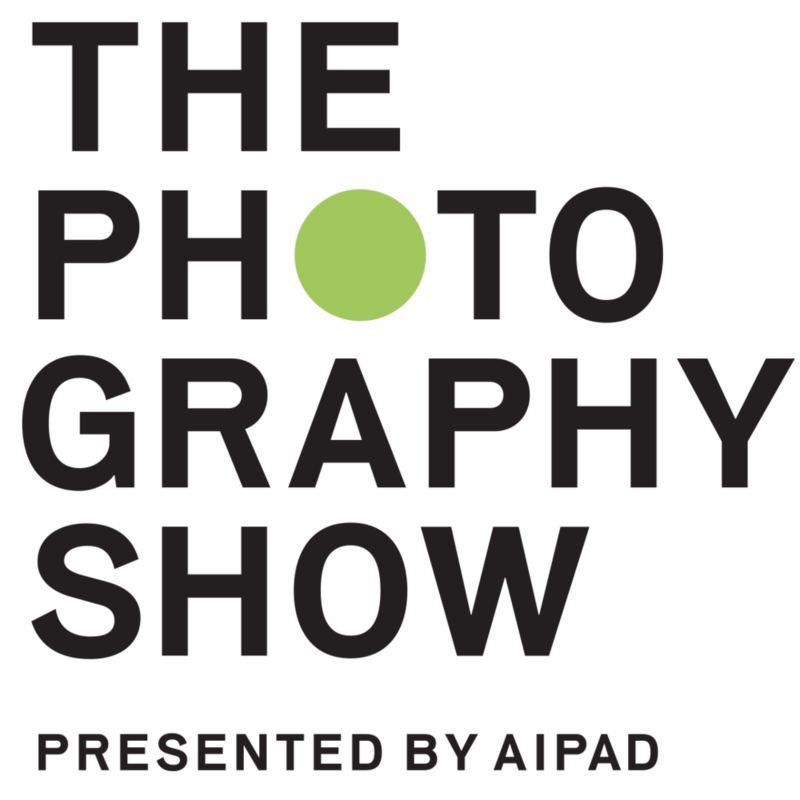 Photography is and always will be one of the basic fundamentals of real, lasting change. It takes something so massive and multifaceted and expresses it in one single frame. That is magical, and impactful. CL: How do you approach a subject about taking a photo of them? EM: I think for the most part this starts with observing. I never go immediately into any situation taking photos. I want to feel it out first. Recognize what I’m being drawn to, and then go from there. For the most part I am capturing candids, meaning I’m not finding it necessary to ask first. For example, when it comes to protests, I’ll wait until after I grab a shot to talk with someone. I usually have the photo pulled up on the back of my camera, and tell them I got a really cool shot of them, and ask if they mind if I talk with them for a few minutes. I want them to see the photo, I want them to like the photo, so that they know that they are involved in this. It helps them remember why they are doing this in the first place. 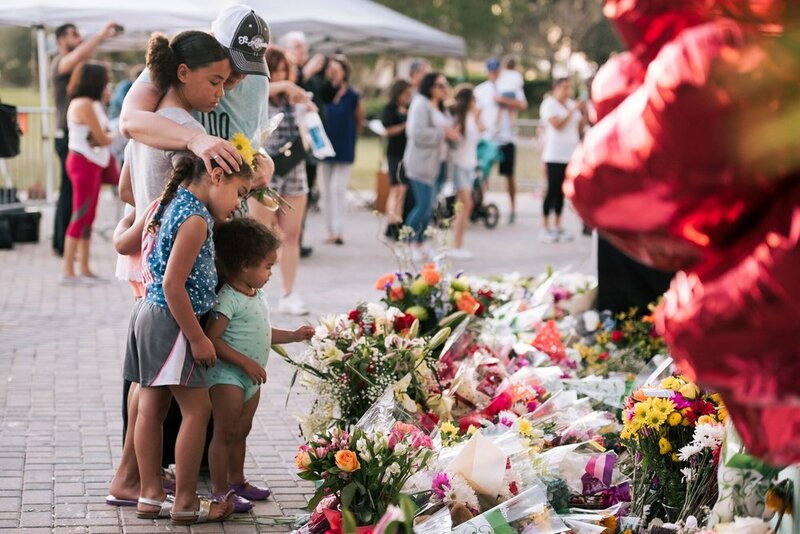 When it comes to Douglas, and I’m capturing images of vigils, and memorials, it’s very different, but I try to approach it in the same way, and show respect. I wait for a time that I feel is best, then I ask. I let them know how powerful their emotion is to me, and ask if they wouldn't mind me capturing it. I’ve yet to get a no. These kids understand what I do better than anyone ever has. They often are thanking me for my coverage. That is what has helped me continue the most. I can’t say that I would if I had been getting negative responses from them. CL: You once wrote, in part, “You’ve got to understand how intrusive this can be. I’m haunted by it constantly … I dwell on respect and not overstepping into someone’s only place for rest.” I can only imagine how difficult that must be. How can you tell where that boundary is? How do you know when it’s best to leave someone experiencing great pain to themselves? EM: Oh wow. I can remember vividly exactly how I was feeling when I wrote that. At that point it had only been 3 weeks since the shooting, but emotionally it felt like a year. I was at a rally, and you could tell by looking into the crowd that many still hadn't slept, or stopped crying. We all were just out of it. It had started to weigh on me. I couldn't tell if anyone could handle having one more photo taken of them. This was around the time I started asking permission first. But it was also the time I started letting some moments go. If taking a photo doesn't make me feel comfortable or confident, I don’t take it. It’s as simple as that. But putting your camera down also opens up the opportunity for you to approach people, and hear their stories in a less intrusive, more genuine way. So I’d consider trying that sometimes. Especially for an ongoing story, it helps build trust and authentic relationships with your subjects that will last a lot longer than just that one event. CL: On a different note, in your Instagram bio, you state the fact that only 8% of photography bylines in newspapers are women. Why do you think this is? What can be done to raise that number? EM: I really will never understand why this is. Women bring such unique and necessary perspectives to visual storytelling. There definitely isn't a lack of us, there is just a lack of opportunity. And it is not just a male-dominated industry, it’s a white-male-dominated industry. There is an insufficient amount of diversity, and that is just wildly unacceptable to me. In my opinion, we are doing a disservice to truth telling. We’re only ever giving one small aspect of the story if we stay sticking to one gender, and one race. Luckily, there are organizations like Women Photograph that are combating both of these issues, and shining a light on statistics like the one I used in my bio. CL: What would you say to an aspiring photographer who is hoping to influence people through their photos? EM: I think being influential comes mostly from your ability to be real. It all starts with your own character. I think to make a lasting impact you need to be real in all aspects of your life, so you're never needing to compromise or change when it comes to your work. It will just be natural and effortless. The most influential images are raw and have a depth to them that gives them an ability to reach people. Just stay true to who you are, maintain your integrity at all costs, and genuinely care about what you do. Emma Gonzalez and her Marjory Stoneman Douglas teacher Jeff Foster, by Emilee McGovern.